Tree 6–10 m. tall, evergreen; very young branchlets minutely stellate-pilose, soon glabrous; bark whitish and longitudinally sulcate. Leaf-lamina up to 10 × 6–7 cm., coriaceous, broadly ovate to ovate-elliptic, apex obtuse or subacuminate, margin entire or undulate, base broadly rounded or slightly cordate, glabrous on both surfaces except sometimes for a few hairs near the base of the midrib, midrib prominent especially beneath, nerves in 4–6 pairs with 1–2 pairs of basal nerves, prominent especially beneath, venation prominently reticulate beneath; petiole up to 6·6 cm. long, basal and apical pulvini minutely stellate-puberulous, rest glabrous; stipules c. 8 mm. long, caducous, linear, subglabrous. Flowers 1–7-nate in axillary fascicles on 1–3-year-old wood. Male flowers on unarticulated stellate-puberulous pedicels up to 7 mm. long: calyx cyathiform, deeply 4–5-lobed, densely greyish-puberulous outside; tube up to 1·5 mm. long, glabrous at the base within; lobes 3·5–5 × 2·5–3·5 mm., ovate-elliptic, with acute apex, longitudinally 5–8-nerved, with a few stellate hairs inside towards the apex, otherwise with subglobose papillae; androphore up to 2·4 mm. long, glabrous, with 8–9 uniseriate anthers; vestigial carpels 4, glabrous, immersed among the anthers. Female flowers and fruit not so far known. Male flowers on unarticulated stellate-puberulous pedicels up to 7 mm. long: calyx cyathiform, deeply 4–5-lobed, densely greyish-puberulous outside; tube up to 1·5 mm. long, glabrous at the base within; lobes 3·5–5 × 2·5–3·5 mm., ovate-elliptic, with acute apex, longitudinally 5–8-nerved, with a few stellate hairs inside towards the apex, otherwise with subglobose papillae; androphore up to 2·4 mm. long, glabrous, with 8–9 uniseriate anthers; vestigial carpels 4, glabrous, immersed among the anthers. Female flowers and fruit not so far known. Evergreen shrub or tree 3–10 m tall. Bark smooth with dark and pale grey patches; ultimate branchlets terete, 2–4 mm wide, whitish, glabrous, becoming longitudinally ridged; bud-scales caducous. Inflorescences axillary, amongst the leaves or more usually below them on older wood, fasciculate with numerous single flowers in bud, but only 1–3 flowers open at one time. Bracts 3–6, ± elliptic, 1–2 mm long, entire or bilobed, sometimes amplexicaul, pubescent. Pedicel 4–6 mm long, 0.3–0.7 mm wide, with short greyish stellate hairs; articulation basal, inconspicuous. Flora districts: Known to me from only seven fertile specimens. Threats to forest at some of its sites are documented in Clarke, Status Reports for 6 Coastal Forests in Lindi Region, Tanzania (1995). In view of these, an estimated area of occupancy of less than 2,000 km2, the species this is here assessed as VU 2Ba, b(iii), i.e.“vulnerable”, in view of its scarcity and restricted distribution. The original authors of Cola discoglypremnophylla drew attention to the close relationship with “ C. clavata” (i.e. C. pseudoclavata). 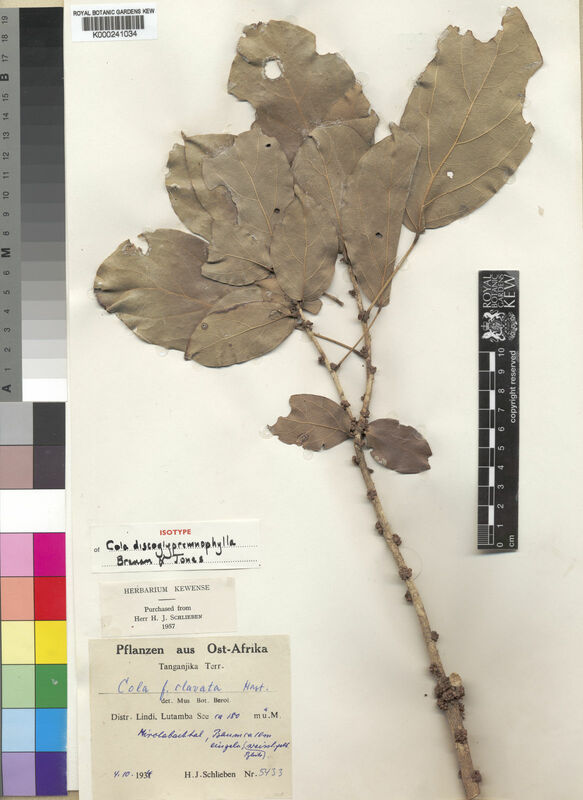 They distinguished Cola discoglypremnophylla principally on the leaves being widely rounded and cordate or subcordate at the base, as seen in the holotype (see Brenan & Jones 1946, Fig. 1). However, the type specimen is aberrant, based on the fertile specimens that I have seen (Luke however disagrees) and this leaf shape is not typical of the species. Brenan was unaware of this aberration, rejecting a later collection by Eggeling of what appears to be this species, on the basis of leaf-shape. In fact, a normal specimen of C. discoglypremnophylla has leaves indistinguishable from C. pseudoclavata and the two can only reliably be distinguished in flower. The four principal discriminating characters are: Pedicel 0.4–0.6 mm diameter, perianth lobes 5, ascending, Pedicel 0.2–0.3 mm diameter, perianth lobes 6–8(–10), ± reflexed, Although no fertile collection has been seen by me from Mozambique (though Wild, loc. cit. refers to a specimen in bud and Luke (pers. comm. 2006) cites Luke & Kibure 10107 from the Mueda Plateau), it is very likely that a plant so widespread in the Lindi area should also occur over the border. Luke (pers. comm.) cites Luke, Luke et al. 7621 (EA n.v.), from Selous GR as firm evidence of the occurrence in T 6. Flora districts: T?6, T 6/T8 T8 Range: Mozambique ?